In addition to numerous waterfalls, the Rear Lauterbrunnen Valley also has a wealth of scenic and cultural assets. Explore the valley with all your senses, in inspiring and encironmentally-friendly fashion. Six special theme trails were created - and another three are in the planning stage. Each UNESCO World Heritage theme trail leads from the information panel at the gateway to the UNESCO World Heritage in Stechelberg into the Rear Lauterbrunnen Valley. The choice is yours: visit waterfalls, hotspots, Alpine farming and mountain hotels or take a tour of discovery full of fables! Follow the symbol for your chosen theme trail on the brown signs. Information panels have been set up at spots linked to the specific themes. We wish you many hours of happy hiking! The Lauterbrunnen valley is the "Valley of 72 Waterfalls". Experience a fascinating landscape and see the waterfalls at close quaters. Sense the tremendous energy emanating from the waters, primarly meltwater from the masses of winter snow and ice. The falls thunder into the valley from the arrival of the warm föhn wind in spring until late in summer - up to 20 000 litres of water per second! Starting in Stechelberg, the trail leads past the Trachsellauenen Mountain Hotel to Schürboden (approx. 1 1/2 hours). A short round hike with a detour to the Holdri Falls takes you to Alp Läger and stunning views of the Schmadribach Falls. Further on, just before Schürboden another small detour takes you to the Talbach Falls. Back in Stechelberg and still thirsty for more water? Then visit the Trümmelbach Falls, with 10 waterfalls thundering down inside the mountain! (Reached by a 40-minute walk or an easy 5-minute ride by post bus). Real mountain romance! the mountain hotels - also known as "candlelight hotels" - are pearls in an Alpine landscape, surrounded by a stunning panorama and built and maintained in traditional style. A cosy restaurant is the perfect place to rest and relax and your friendly host will pamper you with typical local dishes. And if you decide to stay overnight, you'll soon be captivated by old-fashioned charm. Instead of running water, you'll find decorative pitchers and basins in the rustic bedrooms. And for breakfast you'll be served fresh Alpine butter and spicy Alpine cheese. A gourmet tour with the option of an overnight stay. From Stechelberg the hike to the mountain hotel at Trachsellauenen takes about 1 hour. Further up the valley you can either opt for the steep path directly up to Hotel Tschingelhorn (approx. 1 hour) or follow the rushing waters of the River Lütschine via Schürboden up to the candlelit Hotel Obersteinberg (approx. 1 1/2 hours). A tour needing very few provisions in your rucksack. Around 15 cows and the same number of calves still summer on Alp Untersteinberg. The pastures are used and cultivated with a traditional, extremely laborious method of grazing. In spring and summer, the herdsman and his cattle move in stages from the lowest to the highest level. In autumn, the cattle are brought back down through these stages to their winter quarters in Stechelberg. Thus the herdsman and his cattle move eight times in a period of three or four months. From Stechelberg your route leads past the Trachsellauenen Mountain Hotel to Schürboden, the first and in autumn the last, Alpine herdsman's station (approx. 1 1/2 hours). 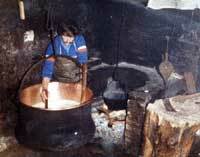 You soon reach the next two alps at Läger and Im Tal, (each approx. 30 min.). Now follows a steep and stony, almost 500-metre climb - imagine that with bag and baggage and all the cows - to Oberhorn, the highest alp at 2029 m (approx. 2 hours). Top the tour with a refreshing dip in the Oberhornsee (lake). Return to Stechelberg via Tanzhubel and Schwand (approx. 4 hours). Hotspots are zones with enhanced natural energy. This energy can be sensed as well as measured and has been used by man troughout time. Hotspots were often ancient sites of worship where churches and monasteries were built in later times. They are mainly found in the natural world, for instance near waterfalls, ancient trees or jutting boulders. From Stechelberg the trail leads past the Trachsellauenen Mountain Hotel to Schürboden and on to Läger, the first place of importance (approx. 2 hours). After another half-hour hike you reache Alp Im Tal, also a lengthy hotspot. 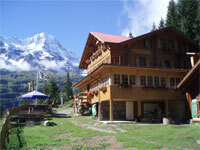 Return by the same path or hike via Wilde Egg to Schürboden and back down the valley (approx. 1 1/2 hours). You can also take the path up to the Oberstinberg Moutnain Hotel and return to Stechelberg via the Tschingelhorn and Trachsellauenen Mountain Hotels. (approx. 3 hours). It is no longer possible to trace whether legends are actually true or have their roots in the fantasy of mountain dwellers. But the mystival landscape in the Rear Lauterbrunnen valley is actually an ideal spot for many legends. Perhaps the answers to the questions they pose are to be found in this magical landscape, so full of captivating corners beneath Lauterbrunnen's snowy summits. Thanks to the topographical location of the Lauterbrunnen Valley (900 - 2200 metres above sea level), all Alpine altitudinal zones are covered and over 25 species of orchids have been recordet. Gentian: Spring gentian, stemless gentian, yellow gentian, purple gentian, willow gentian & field gentian: at least one type of gentian is seen at every time of year in the rear Lauterbrunnen Valley.